Now Sheetfed Printers and converters can introduce the superior properties of UV inks, UV adhesives and UV coatings to their customers. PRIME UV has introduced a compact, small format conveyor with an integrated UV curing system that installs in-line with sheetfed presses. The conveyor extension fits easily within the stacker area of the press and transports sheets through the UV processing unit. The result is immediate and total cure of UV inks, UV adhesives and UV high gloss coatings. PRIME UV's UV Conveyor System curing UV in-line with a Hamada Sheetfed Press. 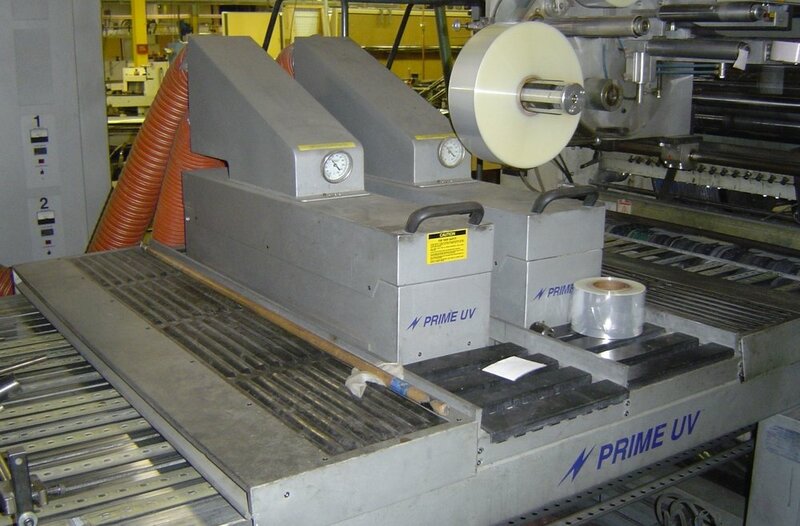 PRIME UV's UV Conveyor System curing in-line with a Ryobi Sheetfed Press. PRIME UV's UV Conveyor System shown curing UV coatings in-line with a Meihle Sheetfed Press.